Featuring a unique collection of over 300 original labyrinth designs. Including Gemini Labyrinths, our innovative two-handed finger labyrinths. Several color options are available, as well as mirror-image format. Just as we all enjoy having many different choices of music to listen to, depending on individual preferences, Harmony Labyrinths™ offers many new labyrinth designs to choose from. 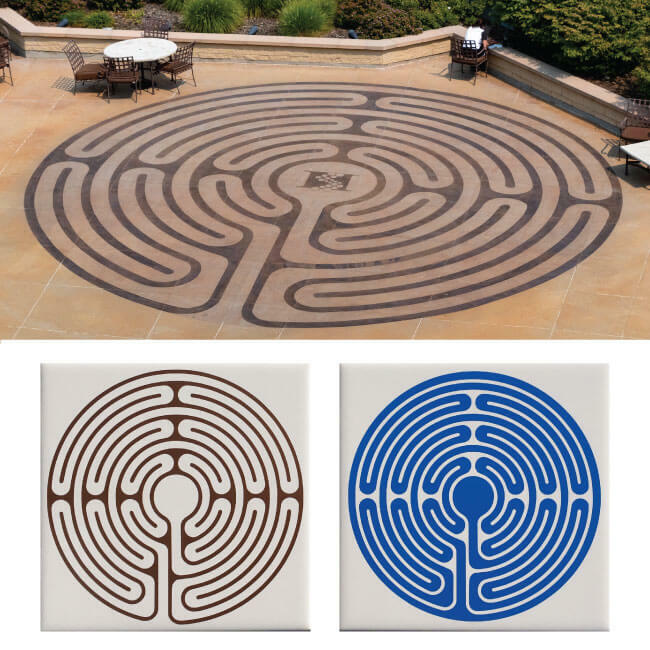 NEW FOR 2016: In response to multiple requests for more affordable finger labyrinths for meditation and stress management, we now offer several of our original labyrinth designs cut in permanent/outdoor quality vinyl applied to commercially produced tiles. No stylus is needed despite their compact size. In fact, we find the sensory experience of tracing with a finger to be more calming. We invite you to explore our Finger Labyrinth Store to see what is currently available, as well as our Finger Labyrinth Gallery to view items that may be added to our store in the future. All images on this website are copyrighted. Our ceramic finger labyrinths will be offered again in 2017. They can be used either as a tool for meditation and stress management, or as a tool for right-brain/left-brain exercises (see below for our tracing techniques). Even though GEMINI® FINGER LABYRINTHS were designed primarily for children, many adults also enjoy using them. As with playing a musical instrument, both sides of the brain are involved simultaneously. The user can choose the degree of challenge desired based on (1) the number of circuits,(2) the format (mirror-image versus rotated) and complexity of design, and (3)the tracing technique, and then proceed at a comfortable pace. One can even start out by tracing each “hand” separately, just as in learning to play a new piece of music on the piano, and then “playing” both hands together. All Gemini® Finger Labyrinths can be utilized with Tracing the Path methods outlined below, i.e., (A) starting with both hands tracing from entrance to center and out again, and (B) starting with one hand at an entrance going inward, and the other hand starting in the center and moving outward, then reversing direction. In addition, the “mirror image” format can be rotated 180° to change the orientation and extend the activity. Tracing either type of Gemini® Finger Labyrinth with just one hand at the end of the exercise is a useful calming technique, the same as with a traditional 360° unicursal labyrinth design. The two separate finger labyrinths can be two of the same design (which you may already have) or two entirely different designs (preferable), but it’s best if they both have the same number of circuits. This technique involves a rotation series of the two finger labyrinths combined with two different ways to trace the paths simultaneously. The greater the number of circuits and turns, the more challenging this activity will be. ROTATION SERIES: Begin with both entrances at the 6:00 position and trace the path (see below); then rotate left entrance to 9:00, right entrance to 3:00 and trace; rotate both to 12:00; rotate left to 3:00, right to 9:00; then left at 6:00, right at 12:00; then left at 12:00, right at 6:00. If you are using two different labyrinth designs, you can then switch their positions and repeat the rotation series. Trace with the traditional method of both hands starting at the entrance, going in and back out again. Trace with one hand starting at entrance and going inward, and the other hand starting at center and going outward, then reversing direction.